Some Southern California Sikhs want a UC Riverside religious scholar removed from his position in Sikh and Punjabi studies because his research challenges their beliefs that the holy scriptures are literally the word of God. Sikhs believe the scriptures were revealed to a series of gurus beginning with Guru Nanak, who founded the religion in the 15th century Punjab state of India. Those revelations in the form of 6,000 hymns were compiled in 1604 by the fifth guru, Guru Arjan, and became the holy scriptures. Pashaura Singh's thesis and subsequent research are based on a manuscript that surfaced in 1987 that he believes is a draft of the 1,430-page document compiled by Guru Arjan. Singh says the so-called 1245 manuscript, part of the rare book collection at Guru Nanak Dev University, includes sections that are blank and others that have been crossed out, showing evidence of having been edited. Singh, who said he has received death threats for his views, said he found a second manuscript in 2002 that also appears to be a draft. The idea that the scriptures were edited or changed is blasphemous to traditional Sikhs. "If this is true, then the revealed word of God is not the revealed word," said Dr. Baljeet Sahi, an Altadena veterinarian and president of Sikhs for Preservation of Sikhism and Sikh Heritage. Sahi called the 1245 manuscript fraudulent and said it was obtained from a scrap dealer. He said it may have been written by one of the guru's rivals, who started a parallel tradition after he was denied a guruship. Singh and others are trying to mix the words of non-gurus with gurus' words, Sahi said. Singh, who defended the authenticity of the manuscripts, said their whereabouts for the past 500 years is not important. "Hundreds of scholars are working on documents recovered from the Dead Sea Scrolls in the 1940s," Singh said. "They are not talking about their history but they are examining their contents to illuminate the ancient Judeo-Christian world." Sahi and others have called for a peaceful protest on the university's grounds from 11 a.m. to 1 p.m. Sept. 26. Singh was hired in 2005 from the University of Michigan following a national search for a scholar to teach Sikh and South Asian religious studies. He was recruited with the promise of an endowed chair that provides financial support for research, even though the chair was not officially approved by the UC Office of the President until recently. The Sikh Foundation raised $500,000 to endow the chair in honor of the late Dr. Jasbir Singh Saini, a Phoenix cardiologist. The foundation, established in 1967, publishes books, funds chairs at universities and assembles exhibitions of Sikh art for museum display. Members of the Sikh community expressed concern in 2005 about Singh's appointment. Ellen Wartella, executive vice chancellor and provost, assured them in writing that while Singh would teach religious studies "it has been determined that he will not hold this chair." She wrote that the search for a chair-holder had been postponed indefinitely pending approval by the UC Office of the President. Wartella said last week that she meant to convey that Singh would not be appointed to the chair at that time. Two years later, when it became clear that Singh was still a candidate, Saini's widow, Saranjit Kaur Saini, wrote a letter to former UCR Chancellor France Cordova urging her to choose another Sikh scholar. It is not uncommon for endowment donors to disagree with the individual chosen to fill the chair, said Stephen Cullenberg, dean of the UCR College of Humanities, Arts and Social Sciences. "We have to make decisions based on what is the best academic scholarship and not the most commonly held position," said Cullenberg, who defended the quality of Singh's research. Van Harvey, a professor emeritus of religious studies at Stanford University and author of "The Historian and the Believer," said, "Whether the Sikh community finds him acceptable or not is a political matter and not an academic matter." Harvey, who graduated from Beaumont High School and chaired Stanford's religious studies department from 1979 until he retired in 1996, said, "My position is your personal religious beliefs are not even to be discussed. The only question is: What is your scholarship?" Singh, who was born in Punjab, was exposed to the western analytical tradition of religious studies at the University of Calgary, where he earned his master's degree in 1987. "My thinking was broadened," Singh said. Singh's research focused on how the holy scripture came into being, how it was compiled and how Guru Arjan refined the language of the earlier gurus to reflect the culture and language of the time. His doctoral thesis, completed in 1991 at the University of Toronto, was almost immediately condemned. "They think the divine word has come from God and is exactly written in the pages," Singh said of his critics. Singh was indicted in 1994 by the Akal Takhat, the Sikhs' highest temporal authority, for blasphemy. Singh said that as a devout Sikh he appeared before the tribunal in Punjab under heavy security because he had received death threats. After hours of grueling questioning, Singh was found guilty. His penance included two days of service at the Golden Temple, the spiritual and cultural center of the Sikh religion, and five days of service at his hometown place of worship, the gurdwara in Detroit. Singh said he agreed to consider the tribunal's objections to his thesis but only if they had academic merit. "I made it quite explicit that none of my critics has any right to abridge my academic freedom," he later wrote. The controversy over his thesis and subsequent published works from what he calls a "fringe group in the Sikh community" has not shaken his faith, Singh said. Singh said he and his family do not attend the Riverside gurdwara after he and his wife and daughter, who has Down syndrome, were accosted by three men who threatened to behead him. 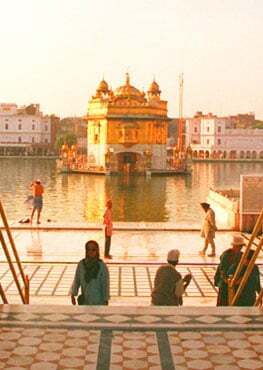 Instead, Singh and his family worship in a special room at home where Dish Network provides broadcasts of daily proceedings from the Golden Temple. Raminder Singh, a Corona insurance broker and spokesman for the Coalition of Gurdwaras of California, said their main concern is that Pashaura Singh is wrongly influencing young Sikhs and others who take his classes by presenting his views. "Our scripture was written and compiled by the prophets themselves," said Raminder Singh, who is no relation to Pashaura Singh. For his part, Pashaura Singh said, "I expose my students to different perspectives on the Sikh tradition in the class and encourage them to make up their own mind in the end." The religion teaches equality for all and emphasizes family and community service. Sikhs reject rituals like fasting and any form of idol worship. They believe that God is present everywhere and make no distinction as to whether God is male or female. The estimated number of Sikhs worldwide ranges from 18 million to more than 20 million. The estimated Sikh population in the United States ranges from 190,000 to 440,000.